In Italy, striking food couriers showed "gig economy" capitalists they're serious about their rights as workers. 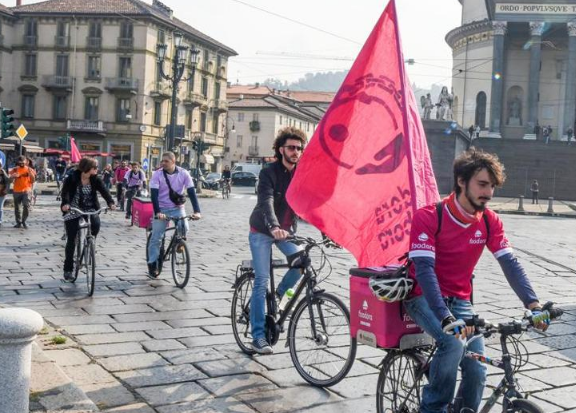 In early October, Italian media outlets ran extensive coverage of protests in Turin, where couriers working for the German food delivery company Foodora mobilized. For a country where industrial action is relatively common, why has a strike consisting of just fifty workers attracted so much attention? The answer is simple: this represents the first-known case of worker self-organization in the Italian gig economy. Foodora, like Deliveroo or UberEats, owns an online platform that uses a “crowd-fleet” of cyclists to deliver food from local restaurants. Like other delivery apps, Foodora owns neither restaurants nor bikes and employs no couriers: its profits come from acting as the intermediary between consumers and workers. Restaurants pay Foodora a commission (roughly 30 percent of the value of the food sold) to appear on their platform and cover the delivery costs. The riders log onto a smartphone app to receive delivery jobs, which an algorithm automatically allocates. Foodora has invested a lot in self-promotion, and its distinctive pink ads can be seen everywhere on Turin’s public transport network. But its smooth expansion into the Italian market hit a snag on October 8, when a group of roughly fifty workers staged their first public protest in Turin, calling for a boycott and seeking the support of the restaurants that use Foodora. Their mobilization closely resembles the courier strike in London this summer. Taken together, these industrial actions reveal how technology has revitalized old forms of exploitation and call for new forms of resistance. If gig-economy workers can connect their struggles to workers in other sectors, we could see an exciting leap forward in the international labor movement. The riders had been demanding better working conditions since April 2016, but their requests had been largely ignored by the company’s management. A dispute about bicycle maintenance and internet connection costs — which workers completely shoulder — sparked the discontent, but it quickly expanded to include disagreements over wages, job classification, and retaliation. However, it was a change in contractual forms that led to the explosion of the protest in October. Similar to the strikes in London this summer, Foodora workers rejected the transition from an hourly pay system (a meager €5.40 per hour) to a payment-by-delivery system (€2.70 each). The new piecework system was rolled out for new hires; the company then announced that it would be extended to the whole workforce in November. This seems to be standard among these start-up platforms: they initially offer relatively high wages to build a sizeable pool of workers only to change the terms once the workforce is large enough to provide a sufficient reserve army. The Foodora couriers rejected this model and demanded decent compensation instead: €7.50 per hour plus a €1 commission per delivery. The Foodora workers, like other workers in the gig economy, also argued against their employment contract, which categorizes them as autonomous contractors rather than employees. As such, they receive no sick leave, holiday pay, or any other kind of standard employment protection. The workers claim that the firm’s requirements prove they are traditional employees: riders agree to weekly shifts, wait at pre-established locations for orders, earn a wage set by the company, and wear branded uniforms. On this basis, the riders demand to be correctly classified as employees and covered by a national collective labor contract. The Italian media’s unusually high coverage of the Foodora protests has been generally sympathetic toward the workers. The riders’ low wages and harsh working conditions sparked public outrage. Thanks partly to their well-managed communications strategy, the Foodora workers’ campaign has successfully won over public opinion, including segments of the media normally hostile to labor struggles. This has turned what could have remained a small-scale labor dispute into a public-relations disaster, exacerbated by Foodora’s clumsy handling of the issue. When company representatives defended the low pay, they claimed that working for Foodora was “an opportunity to cycle around, while also gaining a small salary”: basically, little more than a pastime. Their argument mirrors one often heard in debates about the gig economy: companies defend less-than-subsistence wages on the basis that these micro-jobs are not intended as primary sources of income. Their much-touted flexibility allows part-time workers to fit driving for Uber or delivering for Foodora around other commitments. This discourse hides a basic fact: this counts as work in every sense of the term and deserves to be recognized and fairly remunerated. If the pay is too low to survive on — monthly earnings from Foodora hardly ever exceed €500 — this simply indicates that it is a bad job: precarious, with low wages and adverse working conditions. The argument that workers choose whether to engage in the gig economy doesn’t find much support in a country like Italy, where levels of youth unemployment have skyrocketed (40 percent in 2015) and proper jobs for young people have all but disappeared. For most riders, Foodora was the only option. To be sure, the Italian gig economy does not have a monopoly on precarious and low-wage work. Following the deregulation of the Italian labor market in the late 1990s, temporary contracts and other forms of bogus self-employment have become increasingly common. In 2015, the reform implemented by the center-left Renzi government expanded the use of vouchers. These are hourly tickets used to compensate workers for occasional jobs, and their use has skyrocketed over the last two years. Workers paid with vouchers can be fired in any moment, and have no right to holiday or sick leave. These instruments were not supposed to remunerate any dependent labor relationship, but rather to provide a more transparent form of payment for “off-the-books” cash-in-hand jobs. However, their increased popularity might well mean that they are now substituting contracts which offered more employment rights. The fact that the Foodora protests underline systemic issues that plague the Italian economy might explain why their protests have received so much attention. The company’s employment practices appear as exploitation 4.0: mediated and facilitated by technology, with an algorithm responsible for allocating work and managing the labor process. The gig economy is rapidly spreading, but very few people understand what it actually entails, confusing Foodora with friendlier-sounding sharing platforms, like Airbnb or BlaBlaCar. Thanks to the Foodora workers, the Italian public has suddenly realized that old-school exploitation lies beneath the shiny surface of digital innovation and start-up entrepreneurialism. This perceived novelty has given the Foodora riders a special kind of visibility: Even though the issues they raise are not unique to the gig economy, they are taken to the extreme by the platform’s operational logic. Using an app to mediate labor supply and demand exacerbates the established trend toward individualizing and fragmenting employment relations. The logic underlying the management style of platforms like Foodora is essentially neo-Taylorist: work is split into discrete tasks that can be measured and depersonalized, making all workers interchangeable; workers lose control over the labor process and timing, which the app can now easily monitor. Algorithmic management therefore appears like a reincarnation of the principles of scientific management dating back to the nineteenth century. This is not to say that the gig economy hasn’t innovated. These companies have created new ways to deny labor protections, increase profits, and attract investors. The structure of algorithms and individually paid micro-tasks mask a conventional employment relationship, allowing employers to circumvent basic labor protections. Further, by classifying workers as contractors, employers can justify denying them collective representation through a union. Interacting with an app also tends to make labor practically invisible. The client orders, the food arrives, and no one wonders how this happened so quickly and cheaply. This makes it easier to create working conditions that push the limits of legality. Finally, these companies become more attractive to capital, as they present themselves as tech start-ups rather than as intermediaries that extract profit through old-fashioned mechanisms: the intensification of work rhythms and a squeeze on salaries. From a worker’s perspective, the algorithm created new disciplinary practices. The app monitors work times, taking performance management to the extreme. Customers’ ratings have become another source of control and another mystification. Discipline shifts from the manager to the client, who may not even be aware how her comments are being used. The threat of deactivation for underperformance or troublemaking always looms. Essentially, management is a click away from denying workers access to the means of production. In a standard labor relationship, this might be considered mobbing, but it becomes possible in platform-based micro-employment. As noted above, the Foodora strike echoes the Deliveroo and UberEats mobilizations in London this summer. In both cases, the companies attempted to shift from an hourly wage to piecework pay. The platforms’ business models depend on this: as they rely on a hyper-flexible workforce that can be mobilized according to customer demand, paying by gig rather than by hour helps contain costs and shift the risk of low demand onto the workers. The logistics sectors at large also uses this logic; profit increases primarily come from squeezing labor costs and intensifying work rhythms. And yet, these supposedly atomized and unorganizable workers seem to have become a focal point for a new wave of militancy. The Foodora riders appear to have closely followed their British counterparts’ struggles. Both groups took advantage of the time spent waiting for orders to have conversations, exchange flyers, and arrange meetings. Interestingly, gig-economy strikes have so far been concentrated in those services that retain an element of physical co-presence. Just like in London, Foodora riders planned their actions to raise awareness and build public support: they protested in the city center, wore their uniforms to subvert the company’s branding, disrupted headquarters with noisy pickets, and flyered clients and restaurants that use the platform. These tactics make the invisible labor at the heart of the gig economy visible. By inviting customers and restaurants to boycott the platform in solidarity, the striking workers have brought the tacit role of consumers in this form of exploitation to light. While this strategy appears to have worked well as publicity — some famous restaurants in Turin have stopped using the app — it is hard to judge if it has affected the company’s profits. Without doubt, the Foodora strikers, just like their Deliveroo and UberEats counterparts, have been especially effective at fighting the company on its own terrain: public relations. Hijacking a hashtag used by the company for self-promotion, they have attracted a level of attention that would have been otherwise unthinkable. Most significantly, however, in both London and Turin, rank-and-file unions have strongly supported the workers’ mobilizations. In London, United Voices of the World (UVW) and the Independent Workers Union of Great Britain (IWGB) facilitated the wildcat strikes and negotiations. In Turin, the Foodora riders started off by self-organizing and then found support from SI-COBAS, a rank-and-file union that, together with USB, has led many industrial struggles in the Italian logistics sector. This is no coincidence: mainstream Italian trade union confederations, like their British counterparts, have so far failed to organize workers in these emerging sectors. A predominantly young and migrant workforce, nonstandard employment models, and largely absent channels for representation and collective bargaining have challenged their traditional organizing strategies. In contrast, rank-and-file unions have proven better able and more willing to back up more creative and disruptive mobilizations. So does the Foodora strike offer hope for a large-scale wave of labor unrest among precarious Italian workers? After refusing for weeks the possibility of negotiation with the workers, the company was forced to meet some of their representatives following the media hype generated by the riders’ protests. However, most of the workers’ demands have so far remained unmet. The company rose the delivery fee from €2.70 to €3.60, and offered some special discount agreements for bike repairs. Yet Foodora refused to move back to an hourly wage and to recognize the riders as employees. In addition, it did not reinstate the fired workers, while at the same time punishing some of the protesters by not giving them any more shifts. The availability of a large reserve army of labor from the numerous ranks of the young unemployed in Italy also allowed the firm to easily hire many new workers, thus diluting the unity of the original core of protesters. Foodora was forced to invest significant resources in new promotional campaigns to recover from the PR disaster of the October strike. Yet their strategy of waiting until the storm has passed seems to have been successful in weakening the intensity of the riders’ struggle, at least in the short run. Foodora’s workers are now trying to sue the company, with the rationale that their contract as self-employed is illegal. This might be successful, as many of the arguments that the London Labour Court used to rule that Uber’s drivers might not be considered self-employed seem to apply also in the case of Foodora. And the riders are continuing their efforts to self-organize, in Turin, Milan, and other Italian cities, making links with other food delivery workers and raising awareness about the exploitative employment practices used by firms in the new gig economy and in the delivery sector at large. As these fights evolve, we should focus on one central element: the rigidity of the logistics sector at large. As it stands, companies like Deliveroo and Foodora still need human workers to deliver goods and realize their value. In recognition of this, JustEat and Uber — to name just two — are investing in technology that will allow them to automate their delivery operations. For now, supporting workers’ collective organization and thus overcoming the atomization and individualization that these new forms of employment exacerbate will give their mobilizations long-term substance. Perhaps, the public’s indignation at Foodora’s practices could start a discussion about the entire Italian employment model, where exploitation and precarity have become commonplace even when not managed by a smartphone. However, outrage remains selective. The same mainstream newspapers that write angrily about Foodora commonly employ journalists as contractors. And while exploitation and piecework by means of algorithm seem to have crossed a line in the collective Italian imagery, the struggles of migrant workers toiling in slave-like conditions picking tomatoes in southeastern Italy or getting killed on the picket line in a logistics warehouse still remain largely ignored — possibly because they do not involve white, young, and educated workers who could be the sons and daughters of average Italians. The Foodora strike may inspire other precarious workers, whose lives are characterized by low pay and insecurity. But for this to have wider impact, their struggles must link up with all workers suffering at the hands of exploitative bosses, even outside the gig economy. Building this kind of working-class solidarity and unity is no small feat — but if successful, it could have real consequences for the fate of the labor movement in Italy and beyond. Arianna Tassinari is a labor rights activist and a PhD student in industrial relations at the University of Warwick. Vincenzo Maccarrone is a PhD student in industrial relations at the University College Dublin. In Italy, striking food couriers showed “gig economy” capitalists they’re serious about their rights as workers.